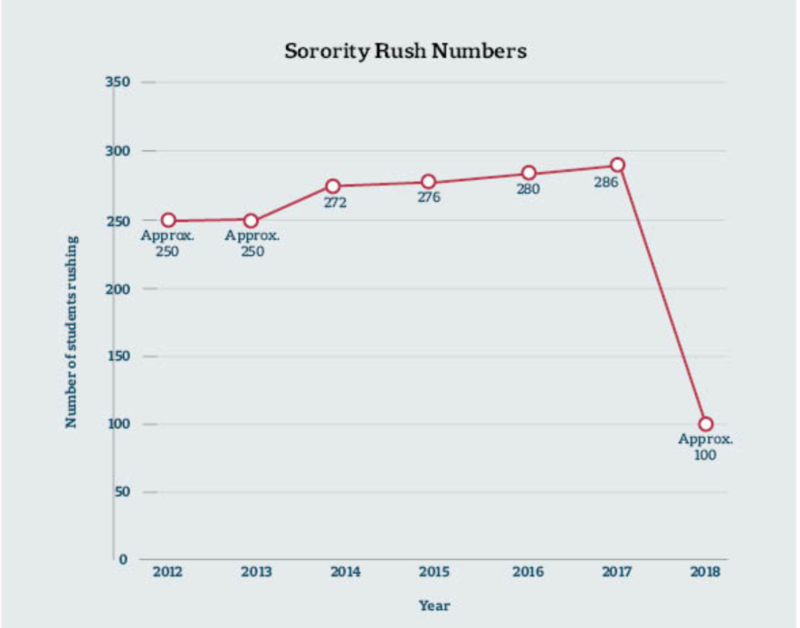 The number of Harvard students seeking to join sororities this semester dropped by roughly 60 percent from previous years—a decrease that came during the first-ever recruitment season in which some sorority hopefuls were subject to the College’s social group penalties. The penalties—which took effect with the Class of 2021—bar members of single-gender final clubs and Greek organizations from holding student group leadership positions, varsity athletic team captaincies, and from receiving College endorsement for prestigious fellowships. Breaking with at least five years of precedent, the Cambridge-Area Panhellenic Council—the governing body for Harvard’s sororities—refused to publicly release the number of students who participated in recruitment this semester. But, according to documents obtained by The Crimson, approximately 100 students registered to attend the first recruitment event. In order to be eligible to rush, students must attend the introductory event and must register in advance, per Council guidelines. The number marks a significant drop from past years. In the 2017 recruitment season, 286 Harvard students expressed interest in female Greek life and, the year before, 280 students registered for sorority recruitment. This fall also marked the first-ever recruitment season for the Fleur-de-Lis, formerly Harvard’s chapter of Kappa Kappa Gamma and the first sorority on campus to go gender-neutral. The Fleur garnered interest from a total of 187 students and ultimately accepted 44 applicants, according to an emailed statement from Fleur President Tiana M. Menon ’19. Caroline E. Diggins '20 waits outside the Sheraton Commander Wednesday morning to greet new Delta Gamma sisters. Murray did not immediately respond to a request for comment about the decline in recruitment interest Sunday evening. University President Drew G. Faust first introduced the sanctions in May 2016; and late last semester, the Harvard Corporation voted to officially confirm the policy. But it is not clear whether the penalties will immediately apply to Harvard’s all-female final clubs and sororities: Under a proposed “bridge program,” campus women’s groups could retain their “gender focus” for at least three years. When the Fleur debuted its new gender-neutral membership policy in Jan. 2018, Menon wrote in a statement that the group plans to remain “female-focused.” The organization’s website asserts its mission is to create a safe and empowering space for “female-identifying individuals” at Harvard. Menon did not directly answer a question asking whether the group accepted any men into its membership this semester. “In keeping with our mission, we didn't solicit gender identities in our registration form so I don't have those numbers,” Menon wrote in an emailed statement. Other campus sororities have opted for a strategy opposite to the Fleur’s, instead openly defying the College’s penalties. Harvard’s chapters of Alpha Phi, Delta Gamma, and Kappa Alpha Theta announced in December they planned to continue with their standard female-only recruitment practices for members of the Class of 2021 despite the social group policy. Asked whether the policy was meant to reduce student interest in sororities during an interview last week, Dean of the College Rakesh Khurana—who has largely become the face of the sanctions on the campus—did not directly answer. “I think people understand that colleges and universities in the larger societies are in transitionary moments around this and those transitions can be sometimes challenging, as organizations adapt and evolve,” Khurana said. This is not to say that sororities are perfect institutions (we aren’t), but that we are an example of what a single-gender organization working towards inclusivity on this campus might look like.